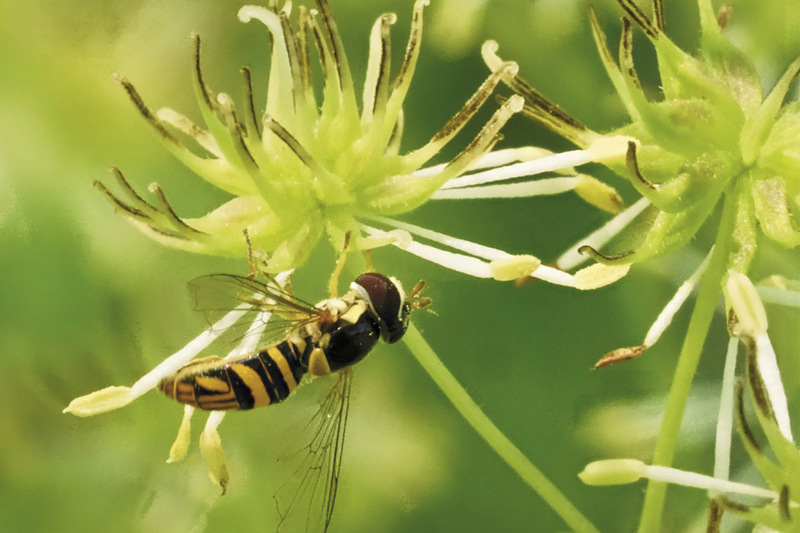 Although insect pollination is more economical, numerous lineages have reverted back to wind pollination, leaving many biologists to question why that would ever happen given the success of insect pollination. This apparent paradox perplexed even Charles Darwin, and still today, little is known about the conditions initiating this transition. In a study published recently in Proceedings of the Royal Society B, the researchers describe for the first time a mechanism driving this reversion involving the vibration of stamens, the pollen-bearing organs of flowers. “We found that plants in which stamens vibrate more vigorously in wind, disperse pollen by wind more readily, and that this characteristic of stamens is favoured under conditions where plants receive few visits from pollinators,” said lead author David Timerman, a PhD candidate working with evolutionary biologist Spencer Barrett in the department of ecology and evolutionary biology in the Faculty of Arts & Science at U of T.
The discovery helps to explain the origins of wind pollination, which is represented in approximately 10 per cent of flowering plant species. “It may also be useful for understanding how plants will cope with a reduction in pollinator services due to the global collapse of wild pollinator populations,” said Timerman. The reproductive structures of flowering plants are the most diverse of any group of living organisms. Flowers vary extensively in size, shape and structure, and much of this diversity is related to modes of pollination. Wind-pollinated species have independently evolved several traits adapted for releasing, dispersing and capturing pollen in air, one of which involves long flexible stamens that vibrate conspicuously in wind. Why and how wind pollination has evolved in flowering plants from animal pollination is a long-standing fundamental question in the evolutionary biology of plants. Early seed plants depended on wind to carry pollen between plants, but about 100 million years ago, flowering plants evolved to attract insects that could transfer pollen with greater precision than random air currents. While wind pollination has since evolved from animal pollination on at least 65 occasions in flowering plants – trees, ragweed and many grasses among them – the mechanisms involved in the transition are not well understood. It has been long held by scientists that wind-pollinated plants are aerodynamically engineered for efficient pollen dispersal. But compared to animal-pollinated species few studies have investigated the function of floral traits associated with wind pollination. Moreover, the modifications of flowers required for the evolutionary switch from insect to wind pollination have not been studied because until now, there have been no experiments on transitional species that are both wind and insect-pollinated. “We took a novel approach to this problem by applying biomechanics to understand the key processes involved in the early stages of this transition, and the work provided several novel insights,” said Timerman. Timerman and Barrett examined the problem in a species called Thalictrum pubescens, of the buttercup family. The plant is an ambophilous species, meaning it is pollinated by both insects and wind. As such, they speculate that the species probably represents a transitional state in the evolution of wind pollination. Timerman used an electrodynamic shaker to apply controlled vibration to stamens to measure their natural frequency of vibration, then used a custom-built wind tunnel to investigate how the natural frequency of vibration influences pollen release. Timerman also performed a manipulative field experiment at U of T’s Koffler Scientific Reserve to confirm whether natural selection acts differently on stamen properties in the presence or absence of insect pollinators. Timerman measured variation in the natural frequency of the stamen’s vibration across nine populations, and assessed the repeatability of vibration frequency over consecutive growing seasons. With all of the data they collected, the researchers analyzed the effect of this parameter on pollen release in the wind tunnel, as well as male reproductive success of plants in the field with and without pollinators. Timerman says when animal pollinators do not provide adequate pollination services, natural selection should favour individuals with flexible stamens that vibrate readily, releasing pollen into the air. “Wind is obviously a more consistent agent for pollen dispersal than relying on insects whose population sizes and behaviours fluctuate in time and space” says Timerman. “Further, many aspects of global environmental change are currently disrupting pollinator service to wild plants, leading to what has been termed ‘the pollination crisis’. Support for the research was provided by the Natural Sciences and Engineering Research Council of Canada.